Australia’s acclaimed HILLTOP HOODS are hitting the road this coming winter for one of the year’s most highly anticipated tours. Supporting the recent release of their #1 Platinum album, ‘Drinking From The Sun’, the Hoods begin their National tour (their only headline tour for 2012) on Thursday the 28th of June. ‘Drinking From The Sun’ was certified Gold on first day of release and reached Platinum status the following week. It also retained the #1 spot on the ARIA charts for 2 weeks, dislodging Adele from the top position. ‘Drinking From The Sun’, HILLTOP HOODS 6th studio album, featured as ‘JJJ Album Of The Week’ and the double Platinum hit single ‘I Love It Feat. Sia’ took over the airwaves across the country as they supported Eminem and performed on the 2012 BDO tour. 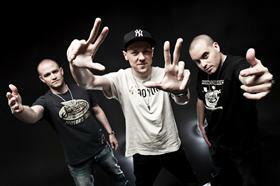 Undertaking their first headline tour since 2009, HILLTOP HOODS will be performing tracks of their new album alongside fan favourites from ‘State of the Art’, ‘The Hard Road’ and ‘The Calling’. Holding down the main support slot on the national tour is Sydney crew HORRORSHOW. This two-man outfit is one of the country’s most promising Hip Hop acts, with two albums, an ARIA nomination, sold-out national tours and festivals under their belt all before they hit 23 years of age. Without any ‘hit’ singles, HORRORSHOW have built a huge support base as well as gaining critical acclaim for their sharp lyricism and hard hitting production. BRIGGS, a young talented emcee hailing from Shepparton, will also be joining this high calibre line up. Since dropping his debut album 'The Blacklist', on HILLTOP HOODS very own label GOLDEN ERA RECORDS; BRIGGS has been a staple on the local Hip Hop touring circuit. While supporting countless local and international artists BRIGGS has been hard at work on his highly anticipated sophomore album, which is scheduled for release later this year. Continuing to rewrite the Hip Hop rulebook, HILLTOP HOODS look forward to sharing their new chapter with supporters across the country as they hit the road this winter on the Speaking In Tongues National tour.